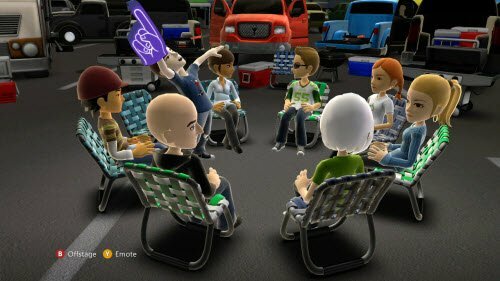 Microsoft Kinect Fun Labs today launched Avatar Kinect, a service which lets your personalized avatar interact with or hang out with up to 7 other friends in 24 virtual stages ranging from a late-night talk show set to outer space. Kinect Sparkler will be launched later this week and will let players use their fingers to draw sparkling lines that whirl glowing, gold stars in front of, behind, and around 3-D photographs of themselves. You can also share your Avatar Kinect and Sparkler creations on Fun Labs or on KinectShare.com. From KinectShare, users will be able to share them on Facebook, email them to friends or download them to their computers. You can expect Kinect Fun Labs to release new applications every once in a while regularly. Presently, Avatar Kinect is available free for Xbox LIVE Gold subscribers who have Kinec. For non-Gold-subscribers it will be available free-to-try for 45 days. Kinect Sparkler will cost 240 points on Xbox LIVE. Read the full details at Microsoft.